The Silvan 50 litre Weedpak 12 Volt Spot Sprayer is a very useful aid to have around the hobby farm, nursery, garden or landscape area. Designed to easily fit on a quad bike, trailer or other mobile equipment the 50 litre Weedpak Spot Sprayer has all corrosion resistant components including an ultraviolet stabilised tank. It can be used with all popular chemical and liquid compounds applied for weed control, spot spraying and fertilisation. The Weedpak Spot Sprayer can be equipped with a choice of two 12 volt pressure pumps with either an open flow rate of 2.4 litres per minute and a maximum operating pressure of 35 psi, or a larger 5.4 litres per minute at 60 psi pump. A six metre length of chemical delivery hose with a telescopic lance is provided for harder to access points. The lance has an adjustable nozzle, spray gun trigger and lock on device while the pump has a three metre wiring loom with alligator clips and connectors to connect to a vehicle battery or similar power source. 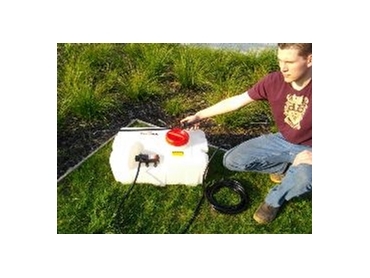 Unladen, the 50 litre Weedpak Spot Sprayer has a weight of only 6kgs and is supplied with a twelve months manufacturer’s warranty. Silvan Australia spokesman Leigh O’Rielly says the 50litre Weedpak Spot Sprayer is one of Silvan’s most popular and inexpensive portable spray units as it fulfils a host of application needs. “Our Weedpak can be carried on and powered from almost any mobile vehicle, is highly durable and is supplied fully equipped as an integrated spot sprayer.” The Silvan 50 litre Weedpak 12 Volt Spot Sprayer is available from most rural hardware suppliers and Silvan and Selecta dealerships Australia wide. 17/06/2014 - Thank you for your emailed enquiry. Please follow the two links below for more information regarding our tanks for quad bikes and our boomless nozzel kits.